Meteor activity saw a big jump last night. Though there were some clouds, overall numbers jumped from 24 to 47 over the past 24 hours. The number of Perseids (PER) also climbed from 11 to 18. This is the largest number of meteors detected by my system in a single night since the peak of the Quadrantids (QUA) on January 3rd. The best meteor of the night wasn’t a Perseid. The featured image shows a -2nd magnitude Eri Eridanid (ERI) seen at 9:29 UT (2:29 am local time). 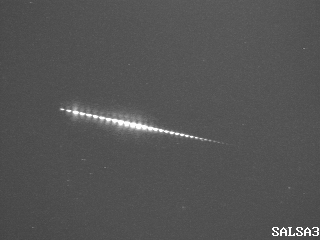 This meteor was also picked up by the NASA fireball network in souther Arizona. Their three camera were able to triangulate the trajectory of the meteor and determine that its orbit had a perihelion distance of 0.95 au, semi-major axis of ~6 au, eccentricity of 0.84 and inclination of 131°. Work by Jenniskens et al. (2016) propose the possibility that the ERIs may be actually related to Comet Halley and could be the beginning of Halley-related activity that culminates in the major Orionids (ORI) shower in October.